← Fantastic Ice Skating Opportunities All Over Chicago – Including Wrigley Field! 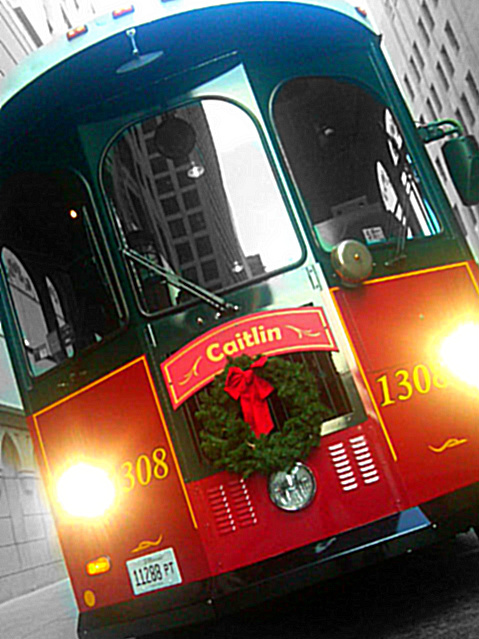 Explore Chicago on the Holiday Lights Trolley or Santa Train! Hop on a Holiday Lights Trolley on Friday and Saturday evenings Nov. 25 – Dec. 23: you’ll be whisked through the snowy streets of Chicago in the warm comfort of a trolley. This 2-hour guided tour will show you the best of Chicago’s holiday lights and sights. You’ll see the festive lights of the Mag Mile State Street and Macy’s Holiday Windows, Daley Plaza’s 40-foot tree, the John Hancock Plaza tree, Navy Pier’s Winter Wonderfest, Buckingham Fountain, Christkindlmarket and more. Hop off at the Lincoln Park Zoo to see the animals playing in the snow and at the Christkindlmarket, where you can enjoy a beer and a brat (mulled apple cider for the kids!) and shop the charming kiosks selling traditional German handicrafts. This is the perfect tour for families with children of all ages, especially families with younger kids that don’t take well to the cold or tend to be slow pokes in the snow. The “Holiday Lights Tour” runs on Fridays and Saturdays, Nov. 25 – Dec. 23, 2011, with four departure times at 5:30 p.m., 6 p.m., 6:30 p.m. and 7 p.m. The tour departs from Chicago Water Works Pumping Station located at Michigan Avenue and Pearson Streets across from Water Tower Place. Tickets are $26 for adults and $19 for children (3-11). As an additional treat, all ticket holders also receive a coupon featuring free hot chocolate and a York peppermint brownie wedge from The Hershey Store! Purchase your tickets in advance online at www.chicagotrolley.com. Also running this holiday season: The CTA’s beloved Holiday Train! If your kids love trains, they’re going to love this special treat: a special six car CTA train, decked out in holiday lights and bows and manned by special elves with extra holiday cheer (and candy canes!). The star of the train is the jolly old man himself, Santa Claus!, who passes through Chicago once a year, pre-Christmas, to visit all the good train-loving boys and girls. The train generally operates from about 1 p.m. to 8 p.m. on weekends and 3 p.m. to 7 p.m. on select weekdays (schedules for each rail line will vary), and will make stops at all stations along the respective routes. The train generally operates from about 1 p.m. to 8 p.m. on weekends and 3 p.m. to 7 p.m. on select weekdays (schedules for each rail line will vary), and will make stops at all stations along the respective routes. Visit www.transitchicago.com/holidaytrain/ for updated schedules.